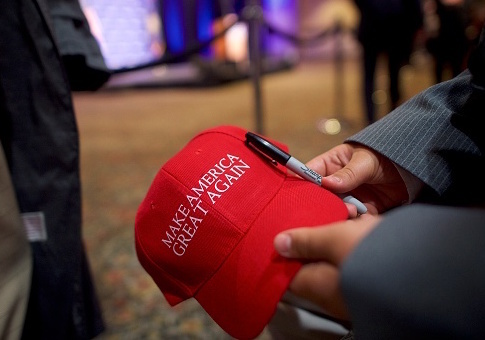 A Canadian judge was reprimanded by a judiciary disciplinary body on Tuesday after he who wore a Donald Trump "Make America Great Again" (MAGA) hat in court the day following the 2016 U.S. presidential election. Justice Bernd Zabel of the Ontario Court of Justice wore the Donald Trump campaign slogan cap to work in what he says was simply a joking celebration of an "unexpected election result," calling it "a historic night in the United States. Unprecedented," the New York Times reported. Zabel entered the court wearing the hat on Nov. 9, and then removed it for the afternoon session. He told a prosecutor at one point that he was a Trump supporter, and that the hat was intended to needle his fellow judges, all of whom supported Clinton, according to court papers. Others, however, weren't amused. The Ontario Judicial Council received 81 complaints about the hat, including one from 27 law professors at the University of Windsor in Ontario. "Are you out of your mind?" one judge had asked Zabel upon seeing the hat. The council initially suspended Zabel with pay pending its decision, but following Tuesday's ruling, he will be suspended an additional 30 days without pay. The court deemed the hat would have been construed as an endorsement of Trump. The ruling further argued many Canadians found Trump’s positions on "women, racialized minorities, and other vulnerable groups to be highly offensive" and "contrary to Canada’s interests and contrary to basic Canadian values." "For a judge to appear to endorse Trump’s views would be perceived by the public to be an expression of opinion on issues of profound importance to Canadians," the ruling stated. Canadian judges are not elected, and in the case of Zabel's court, appointments are made by a nonpartisan, 13-member committee. Judges are not allowed to donate to political parties or participate in any political activities. The commission also received 62 character references from colleagues supporting Zabel and defending his record of tolerance. The support may have been what spared him from the worst possible punishment, removal from office. Following the incident in November, William Trudell, chair of the Canadian Council of Criminal Defense Lawyers, voiced his support of Zabel, the Globe and Mail reported. "It sounds to me like a very unusual situation on a very unusual day in history. He's a fine judge and that's all I would say," Trudell said. "I think everybody reacted in his own way to a most unusual day, and I look at this as a human error, perhaps, as opposed to a judicial one," he added. The council agreed with the character assessment in Tuesday's ruling. "He does not exhibit any of the polarized, misogynistic, racist or homophobic views many of the complainants attribute to Donald Trump," the council ruled. "Members of vulnerable groups need have no fear about the treatment they would receive in Justice Zabel's court." This entry was posted in Politics and tagged Bernd Zabel, Canada, Donald Trump. Bookmark the permalink.